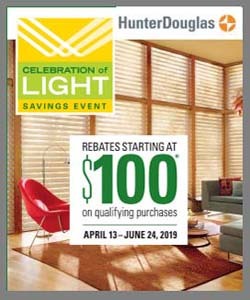 With a vast assortment of products, colors, materials, and styles, the Hunter Douglas lineup has something for everyone. But it’s also an overwhelming selection, and many people just starting their search for new window fashions often aren’t sure where to start. If you’re just starting to look for new window fashions, you can always speak with a trained professional at Bretz Interiors serving the greater Denver area. We’ll be happy to help you narrow down your selection. Plus, we can tell you the features and benefits of each product, including the amazing Pirouette Window Shading. Read on to learn more! Pirouette window fashions have adjustable fabric louvers that make the product look like a Roman shade when closed. When the louvers are opened, they act like a blind, providing excellent view-through. You can close the vanes completely for privacy or leave them anywhere in between. When you want all of the outdoor light to shine in, simply raise the shade until it completely disappears into its attractive three-inch headrail. Soft horizontal fabric vanes attach to a single sheer backing allow for enhanced views to the outside while presenting the full beauty of the fabric to the inside of your room. Pirouettes are available in six different fabrics, and offer a palette of over 63 color options. All fabrics come in two opacity levels—semi-opaque and room-darkening. Plus, Pirouette window fashions provide up to 81% UV protection when the vanes are open and 99% protection when the vanes are closed. The product is available with two manual lifting systems, EasyRise and UltraGlide, or with the PowerView™ motorized system, which responds to a wireless control. 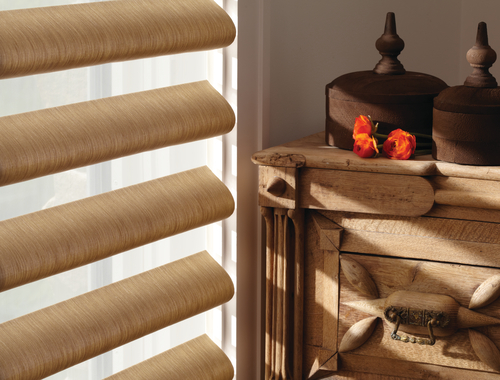 Pirouette® is the ultimate window treatment when it comes to flexibility and versatile functionality. This product is fantastic for any room in the house.